ELKHART (March 12, 2019) – The revitalization of the Elkhart River District will continue in 2019 with additional streetscape work along Jackson Boulevard. The extension of the Jackson Boulevard streetscape will mirror the work already completed to the west, including a new divided boulevard, on-street parallel parking, ADA compliant sidewalks, landscaping, street lights, as well as new and buried utilities. 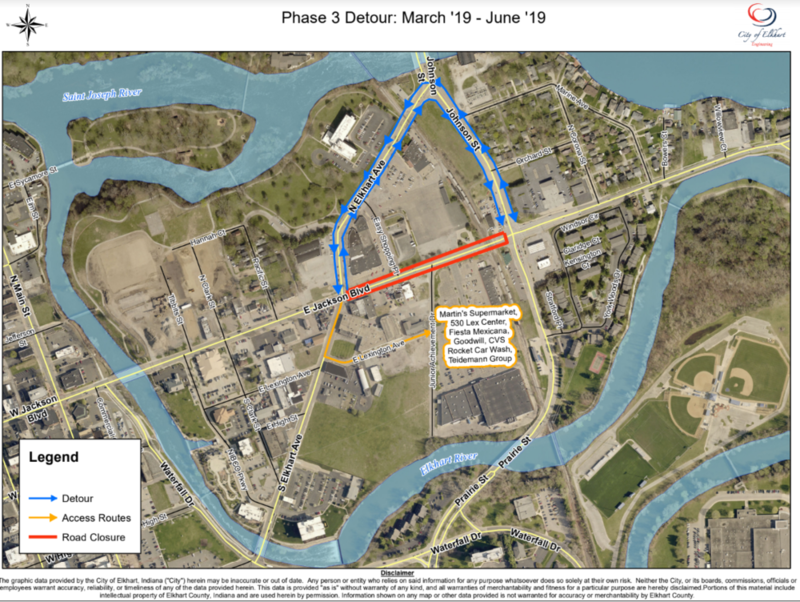 To accommodate these improvements, Jackson Boulevard, from Elkhart Avenue to Johnson Street is scheduled to be closed beginning Monday, March 18. This section is anticipated to reopen July 1. Motorists will be detoured around the closure via Johnson Street, Elkhart Avenue, and Junior Achievement Drive. Businesses in the area will remain open, and additional detour signs will be posted to help patrons access these establishments. Mayor Tim Neese’s intent of the River District Revitalization Project is to develop a vibrant urban space that complements existing Main Street assets and creates a destination where people want to live. The plan calls for the development of 1000+ housing units in the River District and surrounding area to meet current market demand. These additional units are supported by a housing market study completed by the renowned Zimmerman Volk and Associates. The streetscape project will enhance new, exciting investments and private development taking place in the area, including the Elkhart Health and Aquatics Center, Stonewater at the Riverwalk, and the mixed-use neighborhood center being developed by Great Lakes Capital, including a new Martin's Supermarket as their primary retail tenant. The transformation of the Elkhart River District will continue later this year with streetscape projects along Junior Achievement Drive and Lexington Avenue. For more information, visit www.elkhartriverdistrict.com. ELKHART (February 21, 2019) – The third and final anchor project spurring Elkhart’s River District revitalization has taken a major step forward. The Elkhart City Council has approved Mayor Tim Neese’s request for an economic development loan to support the $34 million mixed-used neighborhood center, which will transform the existing Easy Shopping Center South. Developer Great Lakes Capital has proposed to repurpose the site with a new Martin’s Supermarket complemented by 154 residential units that will connect Jackson Boulevard to the Elkhart River. To facilitate the revitalization of this site, councilmembers approved two separate loans, totaling just over $8 million. This includes public financing of approximately $4.6 million, which will be repaid at a three percent interest rate using solely the property tax revenues generated by the new development. The City will also act as a local investor, contributing an approximately $3.8 million direct loan, which will be repaid by the developer at a four percent interest rate. Construction is anticipated to occur in two to three phases and take approximately 18 months to complete. The first phase, beginning this spring, will allow Martin’s Super Market to relocate closer to Jackson Boulevard in a new building with a modern store format, similar to its other successful stores. The 154 residential units will be completed in two phases, following the completion of the super market. These units will join the Flaherty & Collins development as one of only two large scale market rate apartment investments in the City’s downtown in nearly three decades. The complex will offer a variety of units from one bedroom studios to two bedroom apartments. Units will range from 700 to 1,500 square feet. Rental rates will range from $900 to $2,000 per month, with the average unit being 830 square feet renting for $1,080 per month. Mayor Tim Neese’s vision of the River District Revitalization Project is to develop a vibrant urban space that complements existing Main Street assets and creates a destination where people want to live. The plan calls for the development of 1000+ housing units in the River District and surrounding downtown area to meet current market potential. These additional units are supported by a housing market study completed by the renowned Zimmerman Volk and Associates. Note to the press: Attached and below is an up-to-date rendering of the proposed town green, framed by the new mixed-used neighborhood center. ELKHART (December 7, 2018) – Mayor Tim Neese announced today that all streets are now open to vehicle traffic in Elkhart’s River District. This includes arterial streets such as Jackson Boulevard and Elkhart Avenue, as well as secondary streets. With road construction complete for 2018, crews are now focused on the installation of additional lighting along Jackson Boulevard. Crews will also be working on sidewalks, brick pavers, and adding other landscaping elements to the trees that were planted earlier this year. Other winter work will include utility connections to the Elkhart Health and Aquatics center and installation of underground facilities for Indiana Michigan Power and Frontier Communications. As Street Department crews and residents adjust to the reconfiguration of Jackson Boulevard, on-street parking is currently limited to the hours of 6:00 a.m. to midnight. The transformation of the Elkhart River District will continue in 2019. Residents should anticipate reconstruction of the remaining section of Jackson Boulevard, from Junior Achievement Drive to Prairie/Johnson Street starting in March. Streetscape projects along Junior Achievement Drive and Lexington Avenue will also be completed in 2019. Mayor Tim Neese’s vision of the River District Revitalization Project is to develop a vibrant urban space that complements existing Main Street assets and creates a destination where people want to live. The plan calls for the development of 1000+ housing units in downtown Elkhart and the surrounding area to meet current market demand. These additional units are supported by a housing market study completed by the renowned Zimmerman Volk and Associates. The streetscape project will enhance new, exciting investments and private development already taking place in the area, including the Elkhart Health and Aquatics center and Stonewater at the Riverwalk. >>Read full Elkhart Truth article. Join Carl and Emilie Tiedemann, the LEX 530 team and the Elkhart Chamber on November 12th at Noon for the LEX 530 Metropolitan Event Center official ribbon cutting at 530 E. Lexington Avenue in downtown Elkhart. The bright, eclectic center has an urban vibe with eight large windows and 18-foot barreled ceilings. Located on the east side of the Elkhart River, the space will take advantage of the natural beauty of the newly revitalized River District. The beautifully designed space will accommodate everything from intimate gatherings in a special private dining area to large soirées in the event center’s main room. Corporate events, weddings, not-for-profit galas or private family parties are all perfectly suited for LEX 530. Reservations are now being accepted. For more information, visit www.lex530.com or call 574-296-1335 for a personal tour. For social media, visit @theLex530 on Twitter and Instagram in addition to Facebook atwww.facebook.com/theLex530. The LEX 530 Metropolitan Event Center is a modern, metropolitan event center on the east bank of the Elkhart River in the newly revitalized River District. The modern, urban event space can accommodate events from intimate dinners for 30 to special events for up to 250 guests. LEX 530 is owned by Elkhart natives Carl and Emilie Tiedemann. Carl Tiedemann is the founder of The Tiedemann Group of companies which has an array of real estate, construction and wine distribution companies including Tiedemann Wines and Glenwood Cellars Wines. For more information, please visit www.lex530.com. ELKHART - Elkhart Mayor Tim Neese announced today that the City’s River District Implementation Plan has received a Merit Award for Planning by the International Downtown Association (IDA). The award recognizes planning efforts that have established a strategic position for downtown, and that include elements of the plan that have already been approved, ratified, and implemented. Elkhart was one of only six communities in the U.S. to receive this award, joining the ranks of much larger cities including Cedar Rapids, Dallas, and Des Moines. Dave Weaver, RDIT Chair, attended the IDA award presentation in San Antonio, Texas. The IDA is a world leader and champion for vital and livable urban centers. Their annual Downtown Achievement Awards recognize outstanding improvements to downtown by the work of dedicated individuals around the globe. To learn more about the 2018 Downtown Achievement Award and view Elkhart’s winning submission, visit www.ida-downtown.org/eweb/. To learn more about the River District project, visit www.elkhartriverdistrict.com.